Face painting is always popular and is a great choice for keeping the little ones entertained at your next birthday party or event. Let us amaze them with sparkly fairies, scary tigers, and beautiful butterflies. We bring everything that is needed including water, a table and chairs, and wipes to clean up any messes. We also use an example board for the children to choose from. We adhere to strict hygiene practices while face painting. We use a clean sponge for every child, rinse our brushes frequently, use cue tips for lips and change our water when necessary. We keep our workspaces clean and tidy. 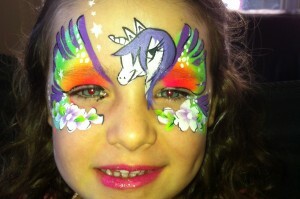 We can face paint 10-12 full designs or up to 25 quick designs an hour (this may vary between painters). The Paint n Sparkles team use only professional high quality face paints and cosmetic grade glitter that is safe around the eyes. We use a selection of FPA, tag, mehron, wolfe, paradise and arty cakes from silly farm. For a price for face painting please contact Sue. 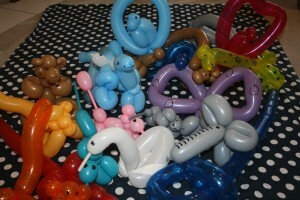 Balloon twisting is great entertainment at parties, and corporate or community events. Why not add balloon twisting to your party package, it is sure to leave a lasting impression long after the party is over. 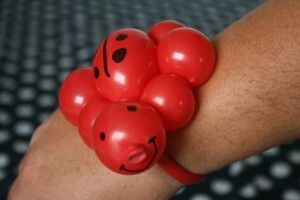 We use only Qualatex professional balloons, which are the strongest on the market. 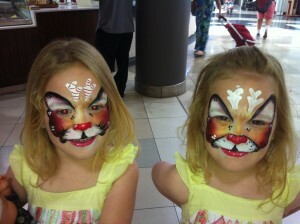 Contact Sue for a face painting and balloon twisting price. Party games can be booked with any of our party services and is sure to add that extra wow factor to your party. We play all types of games including the traditional games (pass the parcel, musical statues, musical chairs and pin the tail on the donkey) as well as games specifically themed to your party. We provide all prizes, props, and music, including pass the parcels. We also have a treasure box of little prizes and lollies for the children who don’t win the games. 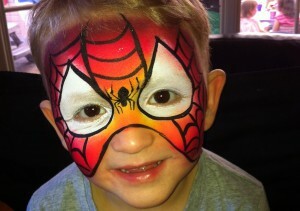 Contact Sue for face painting, balloon twisting and party game costs. 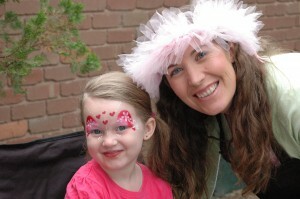 Glitter tattoosGlitter tattoos are perfect for the older children, teenagers and adults attending your party or event. They last from 2-10 days, are applied in minutes and really look amazing! Paint n Sparkles use cosmetic grade glue and glitter and offer over 50 stencil designs to choose from. Glitter tattoos can be easily removed using alcohol wipes or baby oil. Contact Sue for details on pricing for your event. Please give Paint n Sparkles a call to discuss your corporate or community needs. All our services are very popular and can be tailored for all events. We offer competitive rates and can offer discounts for longer events and multiple bookings. In the past we have attended shopping centres, store openings, festivals and corporate Christmas parties and have provided face painters, roving balloon twisters, and art and crafts.